1. Create a sub-directory named VS2017-CLE under the directory where the SWMM 5 Engine source code files are stored and copy SWMM5.DEF and VS2017-DLL.VCPROJ to it. 2. Launch Visual Studio 2017 and use the File Open command to open the VS2017-DLL.VCPROJ file. 3. Issue the Build Configuration Manager command and select the Release configuration. 4. Issue the Build VS2017-DLL command to build SWMM5.DLL (which will appear in the Release subdirectory underneath the VC2017-DLL directory). How to See the Highest Continuity Errors Table in the Output Report ManagerIn the output text report file of InfoSWMM, InfoSWMM SA and SWMM5 there is the Highest Node Continuity Error Table. The Table shows the highest 20 Nodes for percent node continuity errors and the actual continuity error as defined by Node Outflow - Node Inflow. This table is also shown in the Output Report Manger table The same value of Node Outflow - Node Inflow is shown in the Junction Summary table under the column flow volume difference. The units of flow volume difference will be the same as the RPT file if the units are changed in the Output Unit Manger. 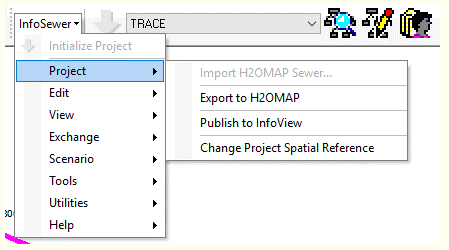 InfoSWMM and InfoSewer from Innovyze both are Extensions inside of Arc Map (versions 10 to 10.6 and counting). As Innovyze Arc GIS products they (and InfoWater) share a common menu structure: Project, Edit, View, Exchange, Scenario, Tools, Utilities, Applications and Help. InfoSewer only has one Application, InfoSewer Load Allocator, whereas InfoSWMM has many additional Applications. These series of blogs attempts to show the commonality in tools between InfoSWMM and InfoSewer.